Neither the peace agreement that ended Sudan’s second civil war (1983-2005) nor South Sudan’s 2011 independence brought stability. A difficult divorce that included a border conflict, an oil shutdown, then brief cooperation, has been followed since December 2013 by a new phase of civil war in South Sudan in which the now two countries’ wars are increasingly merged. The regional organisations that seek to mediate have been unsuccessful, in part because members have competing interests, while outside powers do not invest sufficiently in conflict resolution. With the rainy season’s end, conflict containment is likely to be increasingly difficult. New strategies are needed in several directions: to de-escalate fighting by finding ways to limit foreign involvement and reduce armed groups’ cross-border activity; to curtail arms supply to the parties; to identify how the conflict is financed and propose measures to stop use of oil revenues to fund the war; and to coordinate mediation efforts for the interconnected wars. More active engagement by the UN Security Council, and especially China and the U.S., given their regional influence, is critical. The present combustible situation stems most immediately from the fighting that broke out in South Sudan at the end of 2013 between forces loyal to President Salva Kiir and those associated with former Vice President Riek Machar, due to the failure to resolve longstanding disputes within the ruling party and the army. Following the 2005 Comprehensive Peace Agreement (CPA), Khartoum retained links with Southern armed groups and supported emergent anti-government elements. 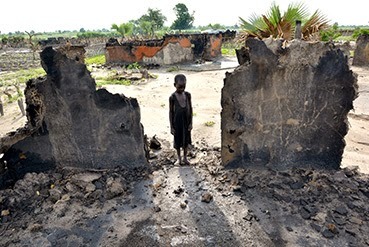 The rupture in South Sudan was preceded by continuous warfare in Darfur and renewed conflict in South Kordofan and Blue Nile states, a consequence of central government failure to put in place reforms demanded for decades by the country’s peripheral regions. Sudan Peoples’ Liberation Army (SPLA) units drawn from areas north of the border before the 2005 peace remained armed and organised and, in 2011, restarted the fight in Blue Nile and South Kordofan, now the epicentre of Sudan’s national conflict. These forces joined Darfur rebel groups that year to create a broader anti-Khartoum coalition, the Sudan Revolutionary Front (SRF), which received aid from South Sudan, in particular via neighbouring Unity state, even before South Sudan’s independence. The new war in South Sudan, which has already cost at least 50,000 dead and displaced nearly two million, short-circuited a rapprochement between Khartoum and Juba that was only a few months old. Uganda sent troops to strengthen President Kiir’s forces, but in the process angered Sudan, its regional rival. Some observers anticipated the rebels in both countries would cooperate against the two governments, given their similar grievances. Instead, those fighting against Khartoum joined with Kiir’s forces against Machar’s in order to preserve their sanctuaries in South Sudan and their claim on continued material assistance. While still keen to improve ties with Juba, Khartoum appears to play both sides by simultaneously giving support to the armed opposition in South Sudan, partly to counter Uganda and partly because Sudanese rebel groups are fighting alongside the South Sudanese government, and serving as a mediator at the peace talks. Within days of the outbreak of fighting in South Sudan, the wars began to merge geographically in its Unity state. As rebels from Sudan joined the fight on Juba’s side, it rapidly became a main theatre, characterised by protracted conflict over major towns and oil installations, mass atrocities and the confluence of multiple armed groups operating with their own agendas. The dividing line in Unity is primarily between Nuer groups, but additional dimensions, including between Dinka and Nuer and Darfurians and Nuer, have created new divisions and calls for revenge. Bitter competition between Nuer politicians from Unity (including Machar) has caused intra-ethnic conflict in the state to reverberate to Juba and the deadlocked peace talks in Ethiopia. Those negotiations, mediated by the Intergovernmental Authority on Development (IGAD), the regional security organisation, are narrowly focused on Kiir and Machar. This is despite the fragmentation and proliferation of armed groups, including those operating across the Sudan-South Sudan border, that are often independent of either’s control and complicate efforts to end the fighting. At the same time, Kiir is mortgaging South Sudan’s economic future by using oil revenue, including the sale of future production at deep discount, to finance his fight. Regional tensions resulting from Uganda’s intervention have further hindered IGAD’s diplomacy, while the African Union (AU) has largely ignored the regional rivalry in its equally unsuccessful efforts to end Sudan’s wars. If there is a chance for peace, it lies in taking advantage of the fact that as complex as the interconnected conflicts are, their cross-border aspects do not divide the UN Security Council. New strategies should begin with more engagement from that body, particularly the U.S. and China, which have close ties with the regional powers. Both pressure and more positive inducements are needed to change calculations in Kampala, Khartoum and Juba. A UN-imposed arms embargo for South Sudan, supported by more effective cross-border monitoring of armed groups and weapons flows, would increase leverage in all directions. This should be done in conjunction with increased monitoring by the IGAD Verification and Monitoring Mechanism of cessation of hostilities violations, including by Uganda. It should be complemented by a mechanism to examine how the war is financed and identify measures to prevent South Sudanese leaders using oil revenues and bankrupting the state to fund their war and enable violations of the cessation of hostilities agreement. All this must support more effective mediation, including greater IGAD outreach to armed groups and hardliners across South Sudan, better coordination with AU mediation in Sudan and more strategic and concerted U.S. and Chinese help to break the regional deadlock. The alternative is further escalation, destabilisation, humanitarian crises and atrocities. c) increasing both pressure and positive inducements on Khartoum, with a view to persuading it to be neutral and constructively engaged in the IGAD mediation. 2. Impose an arms embargo with respect to South Sudan and apply it to all parties with the goal of slowing regional arms flows, preventing further political deterioration and advancing IGAD’s political dialogue. 3. Establish a panel of experts to examine how the war is funded and propose concrete measures within six months to stop South Sudanese leaders from using oil revenues to fund the war and enable cessation of hostilities violations. 4. Consider mandating the UN Interim Security Force in Abyei (UNISFA) to monitor – independent of the Joint Border Verification and Monitoring Mechanism established by Sudanese and South Sudanese governments – the movement of armed groups and weapons along and across the Sudan-South Sudan border and identify sources of weapons and violations of the Sudan-South Sudan Cooperation Agreement and the South Sudan Cessation of Hostilities Agreement. If the mission is mandated accordingly, ensure it has sufficient resources to undertake this task. 5. Ensure timely and public monitoring by the Verification and Monitoring Mechanism of cessation of hostilities violations by all parties, including by Uganda. 6. Increase coordination, via a senior forum, between the AU’s High-Level Implementation Panel (AUHIP) for Sudan and South Sudan, the IGAD mediation process in South Sudan and international actors supporting them, to ensure the cross-border dimensions of the conflicts are properly addressed. 7. Consider how transitional justice and accountability processes can address the cross-border nature of the violence, in particular in South Sudan’s Unity state; and coordinate with the results of the AU Commission of Inquiry’s findings in South Sudan, which should be made public immediately, even if it is not possible to identify those named.